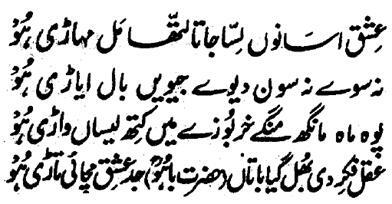 Hazrat Sultan Bahu Rahmatu-Allahe Ta-aala Alaihe says that 'Ishq has settled in front of our threshold thinking us weak and it has held the door of our heart. It neither sleeps itself nor lets us sleep. It itself remains restless and keep us disturbed like a small kid that is ill. It demands from us watermelons in the months of winter although this fruit is available in summer. Now, how can we arrange to grow watermelons in this opposite season? That is, Shariyat has declared the time of seeing the Didaar of Lord on the Day of Resurrection after our death whereas the Ishq demands from us this out of season and time fruit of Didaar during this life! 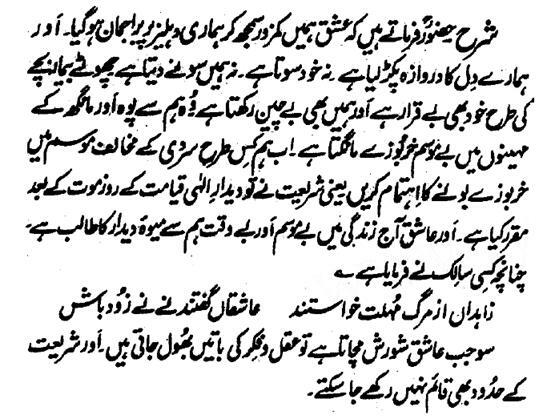 Aashiqeen say 'nay nay but come earlier instead! Hence, when the Aashiq clamors, things of wisdom and sense get forgotten and the limitations of Shariyat also cannot be kept intact (for him).